Explanation: The Tarantula Nebula is more than a thousand light-years in diameter, a giant star forming region within nearby satellite galaxy the Large Magellanic Cloud, about 180 thousand light-years away. The largest, most violent star forming region known in the whole Local Group of galaxies, the cosmic arachnid sprawls across this spectacular view composed with narrowband data centered on emission from ionized hydrogen and oxygen atoms. 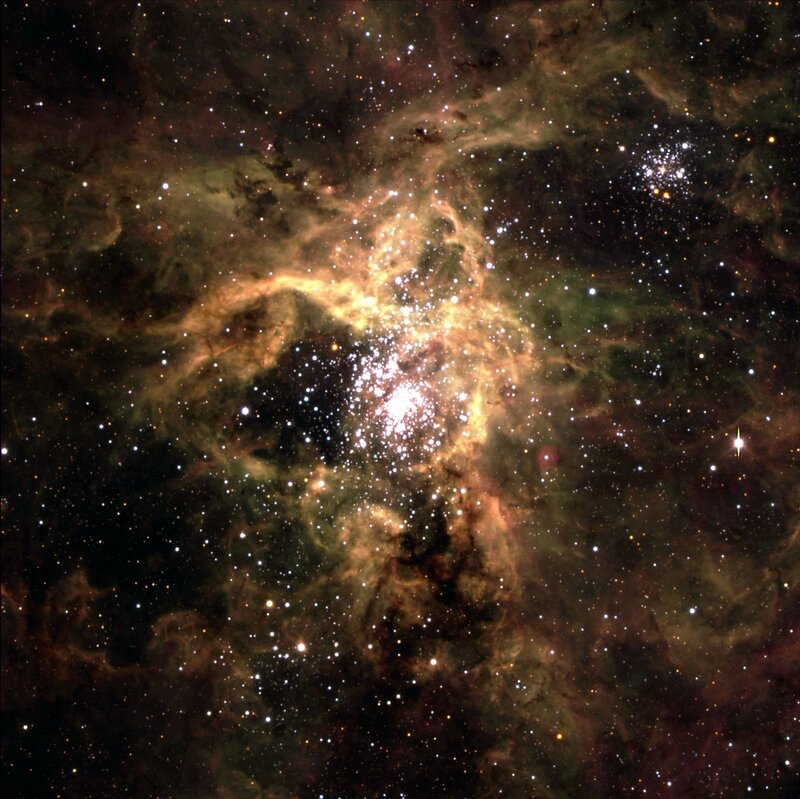 Within the Tarantula (NGC 2070), intense radiation, stellar winds and supernova shocks from the central young cluster of massive stars, cataloged as R136, energize the nebular glow and shape the spidery filaments. Around the Tarantula are other star forming regions with young star clusters, filaments, and blown-out bubble-shaped clouds. In fact, the frame includes the site of the closest supernova in modern times, SN 1987A, right of center. The rich field of view spans about 1 degree or 2 full moons, in the southern constellation Dorado. But were the Tarantula Nebula closer, say 1,500 light-years distant like the local star forming Orion Nebula, it would take up half the sky. have to say though, i can usually see why things have been given their names, but i flat-out can't see a tarantula in that one. Is it right that something 1000 ly wide at 1500 ly distant would take up "half the sky"? Considering the solid angle, I make it only about 5% of the sky, even if we only compare it with the hemisphere of sky that is visible from a point on the Earth's surface. The "Discuss" link on this site https://apod.nasa.gov/apod/astropix.html for today (2017 Nov 16) does not lead the correct web page. I can't either. Maybe it's a cluster of tarantulas? Or a smashed one? Most of the things that have had names for a long time got them because of their visual appearance through a telescope eyepiece. That is, no color, very low contrast, very little structure. Little gray fuzzy things. Our pareidolia is much better at finding visual connections in such things than it is in doing so with colorful, detailed, high resolution images made with modern equipment. i can usually see why things have been given their names, but i flat-out can't see a tarantula in that one. So if the Tarantula Nebula were as close as the Orion Nebula, what would it look like to us? Would it be anything like https://apod.nasa.gov/apod/ap080906.html ? And would we experience any of the unpleasant conditions described in the discussion in this post? http://www.iac.es/gabinete/iacnoticias/ ... laneta.htm . Peter Smith wrote: Is it right that something 1000 ly wide at 1500 ly distant would take up "half the sky"? Considering the solid angle, I make it only about 5% of the sky, even if we only compare it with the hemisphere of sky that is visible from a point on the Earth's surface. However, we don't intuit areas very well. The nebula would span about 60° of sky, meaning that if it had risen above the horizon and we were facing it, we might perceive it as "half the sky", going from near the horizon to about the point most people identify as the zenith (an actual elevation of about 70°, not 90°). 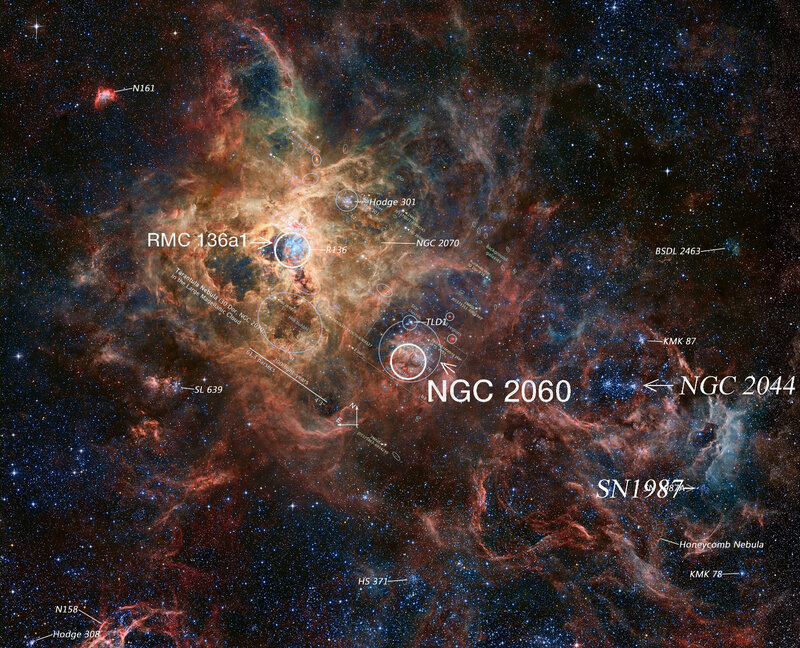 roger@naturalhighs.net wrote: So if the Tarantula Nebula were as close as the Orion Nebula, what would it look like to us? Not too interesting, I think. Yes, we'd have a few more bright stars in the sky. The nebula itself would be nearly invisible to the naked eye, mostly just raising the sky background level a bit. And would we experience any of the unpleasant conditions described in the discussion in this post? The conditions would probably not be too bad unless we were quite close to a very large star. Of course, young massive stars produce supernovas, and you don't want to be within a few tens of light years of one of those. 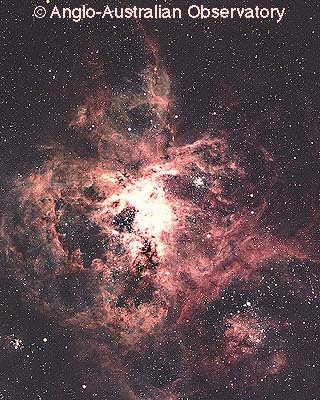 roger@naturalhighs.net wrote: So if the Tarantula Nebula were as close as the Orion Nebula, what would it look like to us? Would it be anything like https://apod.nasa.gov/apod/ap080906.html ? And would we experience any of the unpleasant conditions described in the discussion in this post? http://www.iac.es/gabinete/iacnoticias/ ... laneta.htm . Wild, I wonder if this is just me? When I look at the APOD of your first link (https://apod.nasa.gov/apod/ap080906.html), I get an optical illusion that the starlings are moving, like churning water. It starts after about 10 seconds of looking at the image. I can tell it is just an illusion, because it never happens for the white dots that I am focusing on, it is only in the periphery. The first syllable of Flagellum, the word that does not belong, is "Flag"... are the moderators of this forum illiterate? Alastair Carnegie wrote: The first syllable of Flagellum, the word that does not belong, is "Flag"... are the moderators of this forum illiterate? I am literate, but I did still look it up in the dictionary to ensure I had the right answer. No, and the first syllable of flagellum is "fla", not "flag". Not too interesting, I think. Yes, we'd have a few more bright stars in the sky. Central cluster R136a and the inner parts of the Tarantula Nebula. A few more bright stars in the sky? The nebula itself would be nearly invisible to the naked eye, mostly just raising the sky background level a bit. Is there a good reason to think that we wouldn't see the most highly ionized, innermost parts of the nebula? flag (v.1) 1540s, "flap about loosely," probably a later variant of Middle English flakken, flacken "to flap, flutter" (late 14c. ), which probably is from Old Norse flaka "to flicker, flutter, hang losse," perhaps imitative of something flapping lazily in the wind. Sense of "go limp, droop, become languid" is first recorded 1610s. <<A flagellum (plural: flagella) is a lash-like appendage that protrudes from the cell body of certain prokaryotic and eukaryotic cells. The word flagellum in Latin means whip. The primary role of the flagellum is locomotion, but it also often has function as a sensory organelle, being sensitive to chemicals and temperatures outside the cell. Flagella are organelles defined by function rather than structure. The prokaryotic and eukaryotic flagella differ greatly in protein composition, structure, and mechanism of propulsion. However, both can be used for swimming. An example of a flagellated bacterium is the ulcer-causing Helicobacter pylori, which uses multiple flagella to propel itself through the mucus lining to reach the stomach epithelium. An example of a eukaryotic flagellate cell is the mammalian sperm cell, which uses its flagellum to propel itself through the female reproductive tract. Eukaryotic flagella are structurally identical to eukaryotic cilia, although distinctions are sometimes made according to function or length. A eukaryotic flagellum is a bundle of nine fused pairs of microtubule doublets surrounding two central single microtubules. The so-called "9 + 2" structure is characteristic of the core of the eukaryotic flagellum called an axoneme. At the base of a eukaryotic flagellum is a basal body, "blepharoplast" or kinetosome, which is the microtubule organizing center for flagellar microtubules and is about 500 nanometers long. Basal bodies are structurally identical to centrioles. The flagellum is encased within the cell's plasma membrane, so that the interior of the flagellum is accessible to the cell's cytoplasm. Besides the axoneme and basal body, relatively constant in morphology, other internal structures of the flagellar apparatus are the transition zone (where the axoneme and basal body meet) and the root system (microtubular or fibrilar structures which extends from the basal bodies into the cytoplasm), more variable and useful as indicators of phylogenetic relationships of eukaryotes. Other structures, more uncommon, are the paraflagellar (or paraxial, paraxonemal) rod, the R fiber, and the S fiber. The bacterial flagellum is driven by a rotary engine (Mot complex) made up of protein, located at the flagellum's anchor point on the inner cell membrane. The engine is powered by the flow of protons across the bacterial cell membrane due to a concentration gradient set up by the cell's metabolism. The rotor transports protons across the membrane, and is turned in the process. The rotor alone can operate at 6,000 to 17,000 rpm, but with the flagellar filament attached usually only reaches 200 to 1000 rpm. The direction of rotation can be switched almost instantaneously, caused by a slight change in the position of a protein, FliG, in the rotor. The flagellum is highly energy efficient and uses very little energy. The exact mechanism for torque generation is still poorly understood. Because the flagellar motor has no on-off switch, the protein epsE is used as a mechanical clutch to disengage the motor from the rotor, thus stopping the flagellum and allowing the bacterium to remain in one place. The cylindrical shape of flagella is suited to locomotion of microscopic organisms; these organisms operate at a low Reynolds number, where the viscosity of the surrounding water is much more important than its mass or inertia. The rotational speed of flagella varies in response to the intensity of the proton motive force, thereby permitting certain forms of speed control, and also permitting some types of bacteria to attain remarkable speeds in proportion to their size; some achieve roughly 60 cell lengths per second. At such a speed, a bacterium would take about 245 days to cover 1 km; although that may seem slow, the perspective changes when the concept of scale is introduced. In comparison to macroscopic life forms, it is very fast indeed when expressed in terms of number of body lengths per second. A cheetah, for example, only achieves about 25 body lengths per second. Chris Peterson wrote: The nebula itself would be nearly invisible to the naked eye, mostly just raising the sky background level a bit. We'd see it the same way it looks through a telescope- like a dim gray fog. But when you're inside a fog, you lose any contrast that you have when seeing it isolated against a background. So while we'd definitely detect it as faintly visible, I don't think we'd see much structure- thus my suggestion that in appearance it would essentially be sky background. <<Pea soup, or a pea souper, also known as a black fog, killer fog or smog is a very thick and often yellowish, greenish, or blackish fog caused by air pollution that contains soot particulates and the poisonous gas sulphur dioxide. This very thick smog occurs in cities and is derived from the smoke given off by the burning of soft coal for home heating and in industrial processes. Smog of this intensity is often lethal to vulnerable people such as the elderly, the very young and those with respiratory problems. The result of these phenomena was commonly known as a London particular or London fog, which then, in a reversal of the idiom, became the name for a thick pea and ham soup. From as early as the 1200s, air pollution became increasingly prevalent, and a predominant perception in the thirteenth century was that sea-coal smoke would affect one's health. 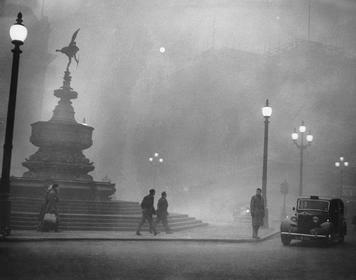 From the mid-1600s, in UK cities, especially London, the incidence of ill-health was attributed to coal smoke from both domestic and industrial chimneys combining with the mists and fogs of the Thames Valley. The earliest extant use of "pea-soup" as a descriptor, is found in a report by John Sartain published in 1820 on life as a young artist: "...slink home through a fog as thick and as yellow as the pea-soup of the eating house; return to your painting room [...] having opened your window at going out, to find the stink of the paint rendered worse, if possible, by the entrance of the fog, which, being a compound from the effusions of gas pipes, tan yards, chimneys, dyers, blanket scourers, breweries, sugar bakers, and soap boilers, may easily be imagined not to improve the smell of a painting room!" The London satirical journal 'Punch' (1860) outlines some venture capital schemes; "Besides a plan just set for making champagne out of cucumbers, a scheme has been devised for the extraction of pea-soup from London fog. When the foreigner remembers that our fogs are now so frequent that the clear blue sky in England is never clearly seen, he may form a faint conception of the work which is cut out for this Company of Soup Makers. The fog will daily furnish a lot of raw material, which English ingenuity will soon cook into a soup."